There’s a reason the iconic line of “where no MAN has gone before” changed to “where no ONE has gone before”. Girls like Star Trek too, in case that’s news to anyone. It’s apparently still a new concept for CBS, or at least Amazon.com, where the collection was originally exclusively available, and where the current line is specifically listed as Men’s Jewelry. 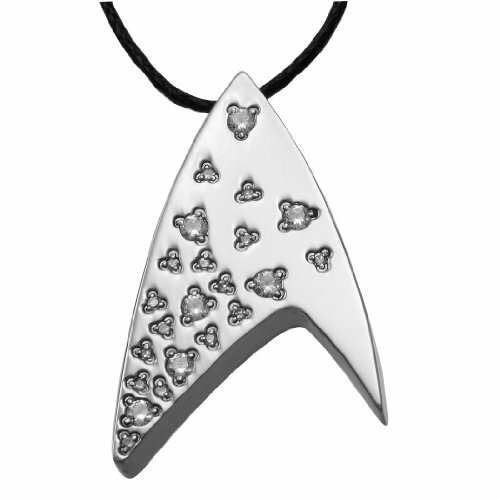 Kudos to the wisdom of StarTrek.Com and Think Geek to not specify the jewelry as being specifically for men OR women. Think Geek was wise enough to at least photograph a female model wearing one of the pendants, while having a male model wear another one of the pendants, to at least illustrate the unisex nature of the jewelry. Picturing actual people wearing the jewelry also helps to show the actual size of the pieces, as the photo of the item by itself can give the illusion it’s some giant, hulking piece of metal, when in reality they’re quite dainty and delicate looking pieces! 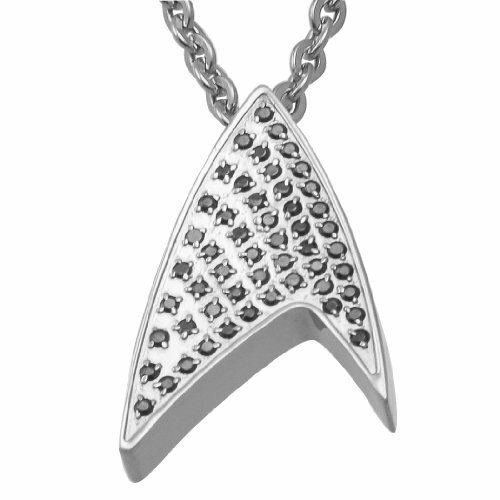 As a huge fan of Star Trek, I’ve been increasingly frustrated in recent years to see the continuing apparent lack of (or at least hard to find) licensed Star Trek themed jewelry for women. I can find plenty of gorgeous fan-made pieces on sites like Etsy, but still the same old standard, and rather uninspiring, Starfleet comm badge and Vulcan salute earrings on official sites like StarTrek.Com. The Udi Behr collection is a breath of fresh air, and a sophisticated and stylish one at that. Possibly the best thing about this collection is the fact that it’s still available! So often there’s been a stroke of genius from a licensee when it comes to geek chic jewelry (jade lightsaber pendants, anyone?! ), only for it to disappear in the blink of an eye. These are businesses after all, and licenses cost a pretty penny, so it’s understandable (but no less upsetting) to see amazing products come and go in a flash. To have most of the Udi Behr collection still available 2 years after it was released is simply fantastic. Granted that’s likely due to the fact that some of the collection is specific to the new Abrams films, but here’s hoping the collection stays around for a couple more years to come. 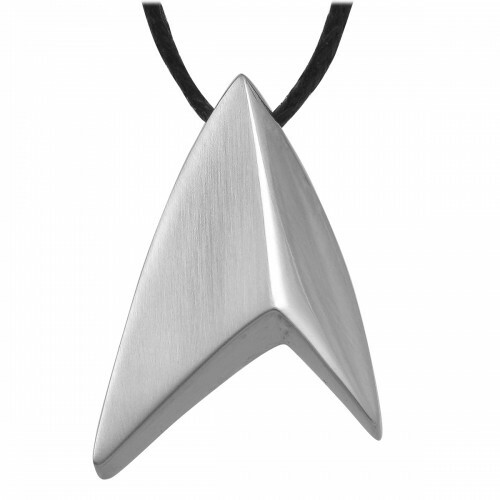 I’d been wanting an Udi Behr piece since I first spied the collection, and finally purchased the Titanium Starfleet Insignia Pendant via Think Geek. 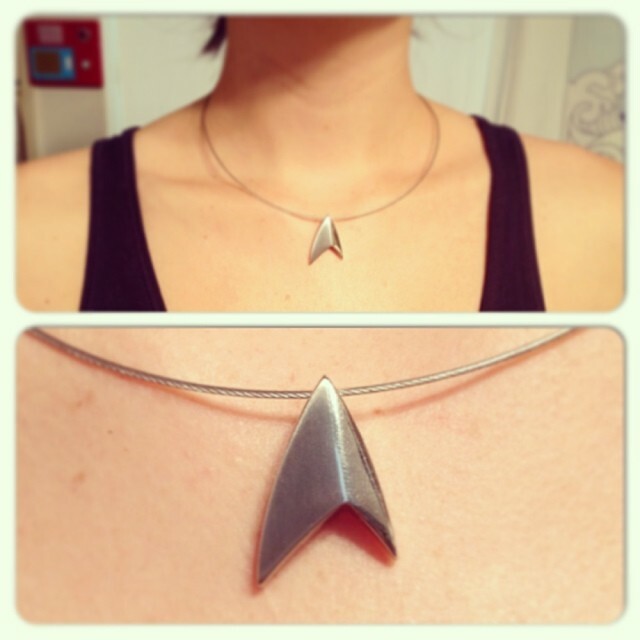 It’s my first piece of Star Trek jewelry and I’m head over heels in love with it. It’s simple but stylish, incredibly Star Trek, and yet subtle at the same time. One half of the delta is polished and shiny, and the other half has a sandblasted texture to it. Most of the Udi Behr collection comes on a cheap leather cord (it’s for “men” after all) that I immediately cut off so I could slip the pendant onto a metal cord choker piece I picked up at Michaels. I would highly recommend having another chain ready to use on any of the Udi Behr pieces you might purchase. The holes on the pendants are quite tiny, so you’d have to cut the existing chain off to slip a new one on. That might seem a bit labor-intensive, but I think it’s work it. I appreciate the design of the holes in the pendants (as opposed to a bail soldered on top) as it keeps the pieces incredibly sleek looking and minimal. The pieces generally range from $30-40, and are well worth the price for the quality and design of the pieces. 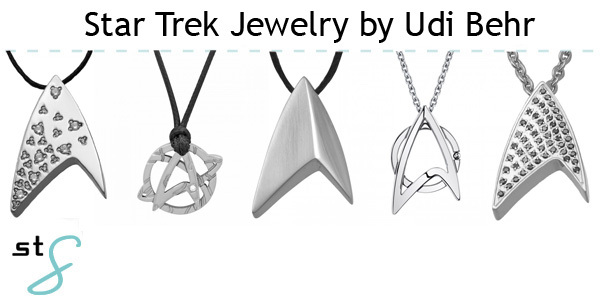 Do you own any of the Udi Behr Star Trek jewelry pieces, or is there a piece you can’t wait to own? Share with us on Facebook and Twitter! And stay tuned for next Monday’s post when I’ll cover the only other licensee offering gorgeous, high-end Star Trek (and DC Comics!) jewelry.